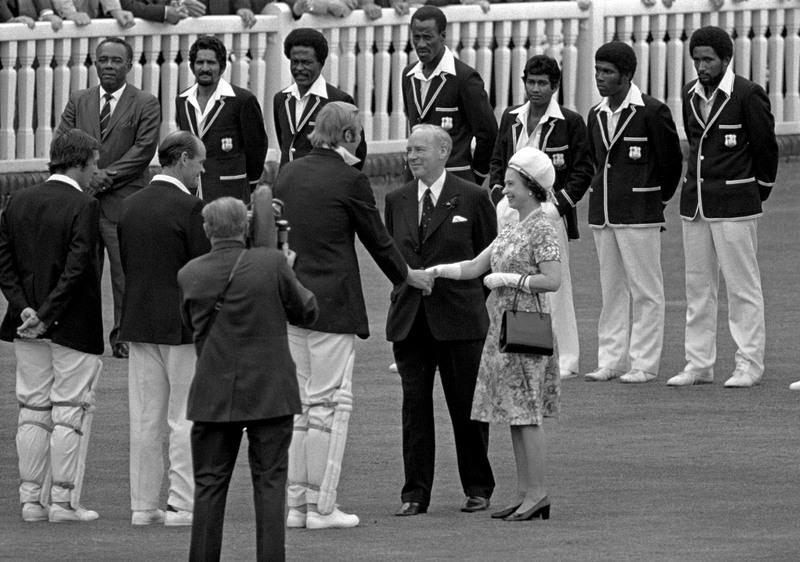 For a 16-year-old Indian obsessed with cricket, the contest between Tony Greig's England and Clive Lloyd's West Indies in the summer of 1976 was a morality play in black and white, if you'll pardon the pun. Greig, South African born and raised, and as blond and white as one can get, had rashly promised to make West Indies "grovel". That a privileged child of apartheid could use such a word when about to commence a Test series against a team comprised of the descendants of slaves and indentured labourers was breathtaking in its lack of political or historical nous. Forty years from the events of that tumultuous time, it is an opportune moment to see how things looked back then and in what ways our perspectives may have changed. The two teams could not have been more different when it came to charisma. England was a veritable Dad's Army with the likes of Brian Close, John Edrich and David Steele manning their top order, and even their younger lot - Peter Willey and Bob Woolmer for instance - seemed stodgy and reliable at best. West Indies, on the other hand, oozed flamboyance: Viv Richards, Alvin Kallicharran, Lloyd, Gordon Greenidge, Roy Fredericks, Collis King and Michael Holding, to mention only some. Like most teenage fans across the world, I did not merely want West Indies to win the series, I wanted to see them annihilate England. My images of that summer were largely from the BBC's commentary accessed via a short-wave radio that was, to put it mildly, on the temperamental side, and Khalid Ansari's Sportsweek magazine with its superb line-up of syndicated columnists and black-and-white photographs. It was almost better than being there, because your imagination had to work overtime to create reality. I mainly recall Richards and Greenidge repeatedly savaging the English attack, Greig's stumps sent cartwheeling time after time - and that Holding spell to Close that made your blood run cold. I had thought it a one-sided contest, with England on the ropes all the time. Yet, as I pored over the scorecards recently, I realised the series had been better fought than I remembered. The first two Tests were drawn, with England having the edge in the second. They did get blown away in the third, but the fourth was close: Greig made 116 and an unbeaten 76 and England fell 55 runs short. West Indies romped home in the fifth Test for a final scoreline of 3-0, but 2-1 would not have done injustice to the merits of the contest. There was something quintessentially English (and utterly daft) about preparing to face some of the world's fastest bowlers by enlisting the services of a 38-year-old opener (Edrich) and a 45-year-old (Close) to bolster the middle order. It was as if amid a tumultuous decade marked by race riots, miners' strikes, economic strife and England's seemingly inexorable decline toward a querulous post-imperial mediocrity, the selectors had decided they would quite simply turn the clock back and restore the old order through sheer denial. Send in the old guard and keep the restive hoi polloi in line, as it were. What I had forgotten, and the scorecards now reminded me, was that until they were dropped for good after the third Test, Close and Edrich did better than most of their younger counterparts in dealing with the West Indian fast bowlers. The experiment with geriatrics wasn't the dismal failure I had thought it to be. The third Test, at Old Trafford, has become infamous for the post-tea session on the third day, when the West Indian fast bowlers, Holding in particular, unleashed a barrage of bouncers that seemed intent on maiming Edrich and Close (promoted to opener in this Test) rather than getting them out. The fearsome shellacking they took that evening, and especially Close's refusal to show the slightest sign of fear or pain despite wearing many a ball on his ribs, shoulder and forearms, has justly gone into legend. 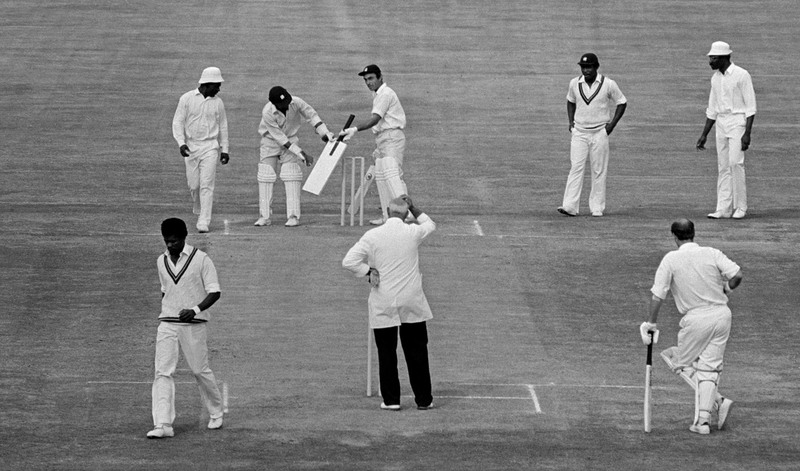 It was an evening of colliding masculinities in its own way: the young, fit and lissome figure of Holding, rocking to the rhythm and riding on the waves of a cheering Caribbean crowd in England, versus the dogged, dour and bald Close, defiantly refusing to concede his wicket come what may. Empire held - at least for the duration of that evening, as Edrich and Close saw the day through without being parted. The next morning England's capitulation was swift and complete, in large part because the West Indian fast bowlers tried to get - rather than knock - the batsmen out. "Guyana unfortunately became a divided country since we were born - between Afro-Caribbeans and Indians. So it became a divided country racially. How are you going to be successful? … Obviously the Afro-Caribbeans, you got to understand that they are more athletic and they have got rhythm and they are quick. So basically they become the quick bowlers that made West Indies cricket successful. We being Indian boys growing up in the villages, we are not used to this kind of life. You should sit in the dressing room and you hear the comments. 'You Indian boys are too weak. You are not strong enough. You can't do this. You eat dal and chawal bhaji [pulses and rice and vegetables]. You boys must go and eat beef.' It became an intimidation. For me, I took it as [saying that] I've got to work harder if I am going to be successful. That is what I did. I used to train harder. I used to run and run and run. So that played a big part in my athleticism. At the end of it I became one of the best fielders in the West Indies. I am not complimenting myself. That is what made me, and the hardship became easy." Kallicharran's recollections complicate the narrative of black versus white that dominates the discussions around 1976. That narrative, perhaps unwittingly, throws into shade the struggles of Indian and other minority cricketers in the Caribbean to find a place in the sun. Kallicharran's reminiscences jive well with the memories of my Guyanese Indian friend and fellow cricket tragic. He remembers his dad turning up the volume on the radio commentary back in Georgetown when Sunil Gavaskar or Mohinder Amarnath batted well against the West Indian fast bowlers - not because he wanted to hear it better, but because he wanted his Afro-Caribbean neighbours to hear it better. That was his way of showing them that the notions of Indian weakness against pace were a myth. There were more racial divides at play than just those between white and black in 1976: some were merely more visible than others. Greig's South African-ness played a huge part in the animosity that his comment evoked, and the West Indian players and fans were explicit about that. In the late 1960s and early '70s, few issues divided the cricketing world as intensely as the need to boycott apartheid South Africa, and it seemed to the coloured nations that England (and Australia) had to be dragged kicking and screaming to see the light in this regard. Greig's relocating to England to pursue his dreams was an index of the racial privilege that secured him easy transit across the white Commonwealth. Indians of my generation had watched with chagrin as we forfeited the chance to win the 1974 Davis Cup because our opponents were South Africa and Prime Minister Indira Gandhi decided we should forfeit the finals rather than legitimise the apartheid regime by playing there. It galled us that the tennis authorities would not call for a boycott of that nation and that instead we had to penalise ourselves. English cricketers like Graham Gooch, Geoff Boycott, Alan Knott, John Emburey and Mike Gatting lost all credibility with many fans of my generation when they were lured by apartheid South Africa's coin on the rebel tours. And it vexes me no end that today the likes of Gooch and Boycott are feasting merrily at the subcontinent's generous table as media analysts, coaches and consultants. Once a mercenary, always a mercenary, I think with some bitterness. These guys weren't journeymen cricketers who desperately needed the money to get through the off season but players who had had reasonably long and successful Test careers. On the matter of boycotting apartheid South Africa and on a host of other issues pertaining to imperialism and its complex legacies, England exemplified the amnesia so wonderfully expressed by Whiskey Sisodia, a character in Salman Rushdie's The Satanic Verses, when he stutters, "The trouble with the Engenglish is that their hiss hiss history happened overseas, so they dodo don't know what it means." Having invented the game and spread it to the far corners of the world through conquest, England seemed to display a strange and provincial inability to see how its actions might appear to others, leave alone own up to the responsibility that came with Empire. It has taken people like me a long time to view the actions of at least some of those cricketers who went to play in apartheid South Africa in a slightly different perspective. 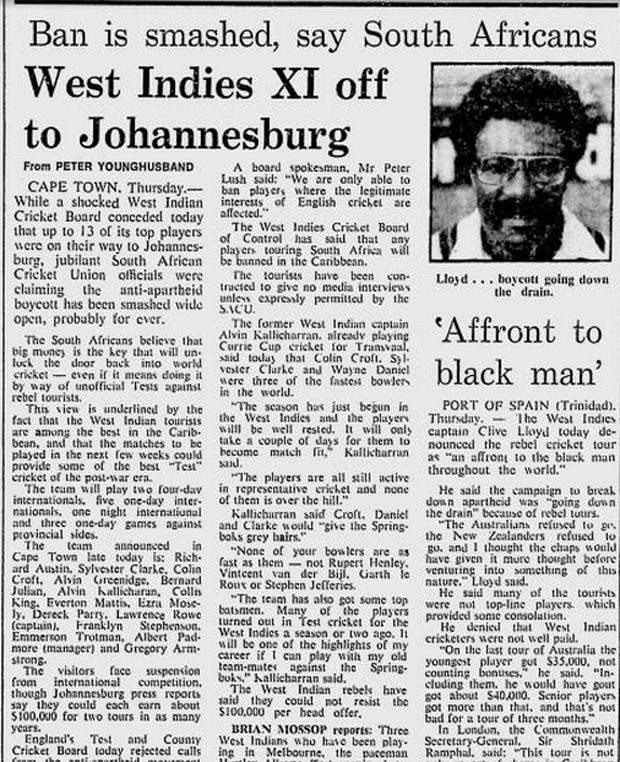 The rebel tours by non-white teams from Sri Lanka and especially the West Indies were important in this shift. Holding, Lloyd, Richards and others who criticised their compatriots who went to South Africa in 1983 sound a bit sanctimonious once you consider the dire economic circumstances in which many of those rebel tourists found themselves. They included Kallicharran, Lawrence Rowe, Bernard Julien, Collis King, Sylvester Clarke and Colin Croft - guys who in their prime were among the best in the world, not just the Caribbean. 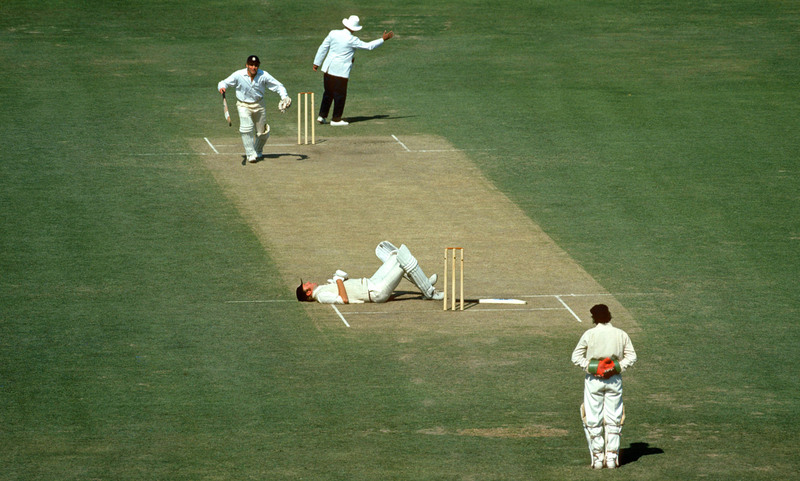 A sportsman's shelf life is extraordinarily short (well, unless you were an English batsman in the 1970s) and could be rendered briefer through injury. Committing to sport at that level could mean you forwent other marketable skills or educational qualifications, especially if you were from a poorer country and an ordinary socioeconomic background. I now have a tinge of sympathy for those West Indian and Sri Lankan cricketers who broke rank. Their economic circumstances may not have allowed them the luxury of hewing more closely to their ethical principles. The issue of apartheid was the backdrop against which Greig's "grovel" comment gained salience. He should have known better than to have used that word, and as a 29-year-old he couldn't exactly use youthful ignorance as an alibi. Yet it was hard for me to square Greigy with being racist. He had endeared himself to Indian fans both on the 1972-73 and the 1976-77 tours (the latter as captain), and unlike many of his team-mates who acted as if they had been frogmarched to the subcontinent by their cricket board, he seemed to enjoy India's heat, dust and the heaving crowds that thronged the stadiums. His career as a commentator only confirmed his love for the game irrespective of the colour of those who played it. His ebullient voice became the soundtrack for Sachin Tendulkar's brilliant knocks against Australia in Sharjah and Sri Lanka's charge to victory in the 1996 World Cup. The contrast between his even-handedness and the one-eyed partisanship of many Australian commentators on Channel Nine was stark. With the passage of time, I am less inclined to be as judgemental of Greig's outrageous comment as I once was. It was flip, ill-advised and freighted with a painful history - but it may not have been malicious, let alone racist. It is strange to think that the larger-than-life Tony Greig has joined the firmament of deceased cricketers long before his time. Despite leading players off to Kerry Packer's World Series and breaking the trust reposed in him by the English establishment, and despite his most un-English effervescence, he was welcomed back into the fold before his death. His wryly thoughtful Cowdrey Lecture is well worth a read. Holding's Jamaican drawl is now the distinctive voice of English commentary, and his measured calm is such a contrast to the terrifying spell he bowled back then. Close recently joined his skipper Greig in the world beyond, and remains synonymous with the sort of insanely courageous batting that we may (fortunately) never have to witness again. And though black pride and the fire in Babylon endured for an impressive two decades after that tour, that very success is now used to indict contemporary Caribbean ineptitude in the longer format of the game. A multiracial South African team is back in the cricket fraternity, the centre of the game's gravity is in India, and the ICC is headquartered in Dubai. That almost none of this might have seemed conceivable in the uncharacteristically hot summer of 1976 should remind us that what makes the future the future is precisely the impossibility of anticipating its trajectories. And in that, it resembles nothing more than a keenly fought cricket match.